We have already seen it being tested as a prototype and on the feet of Messi on the cover of the football magazine FourFourTwo  and now it's finally official: We present to you the new Adidas F50 Adizero, which is the fourth generation of the Germans' lightweight boot. Last year, the Adizero was launched in a rather aggressive colourway, and Adidas are very much keeping the momentum with this new Yellow/Black/Green boot. Back in 2010, when Adidas launched their first generation of the Adidas F50 Adizero, the boot revolutionised the speed boot market as it weighed in at no more than 165g. 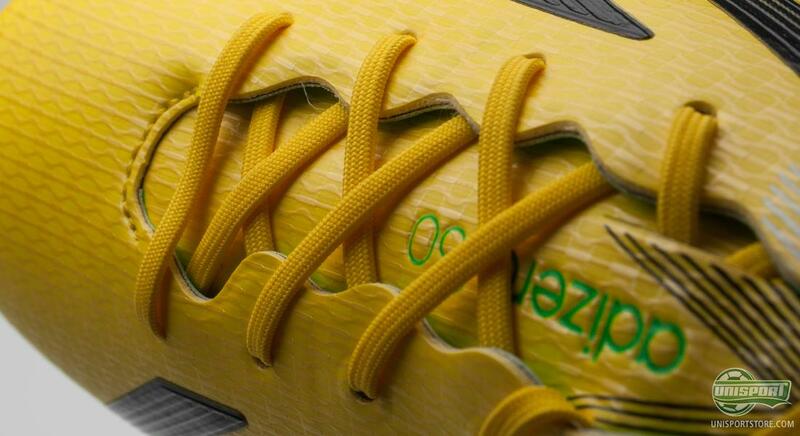 Hereby, the Adizero really pushed the boundaries for what you could expect from lightweight boots. Now they have launched the fourth generation in an updated version where Adidas have further built on the elements that made the previous generations so popular. 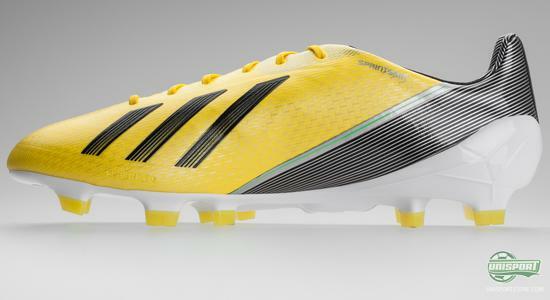 You can pre-order the Adidas F50 Adizero already now, and the boot can become yours for just 215. The Adizero microfibre boot is built from three main elements: Sprintweb, Sprintskin and Sprintframe, that each have their own important function regarding both weight, stability and speed. 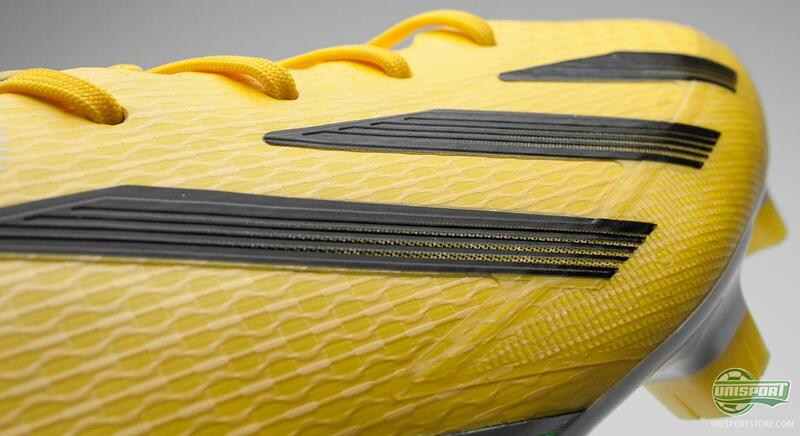 Adidas have focused on tweaking the technologies of the boot, and especially the Sprintweb and Sprintskin have been optimised for this new boot. In addition, this new Adizero colourway is sure to attract a lot of attention, and might very well split the crowd due to its rather flashy colours. 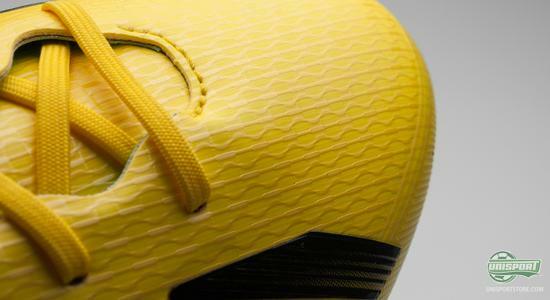 Adidas F50 microfibre still weighs in at just 165g, and hereby keeps its position as one of the absolutely lightest boots on the market. It is important to Adidas that they provide a true lightweight experience, and combined with the minimalistic design, this boot truly expresses speed. The most significant change lies in the Sprintweb construction, which functions as a backbone to ensure that the boot maintains its shape, as well as, to provide support and stability to your foot. Adidas have removed the wide Sprintweb band from the third generation Adizero, as they wanted to make the upper more flexible. 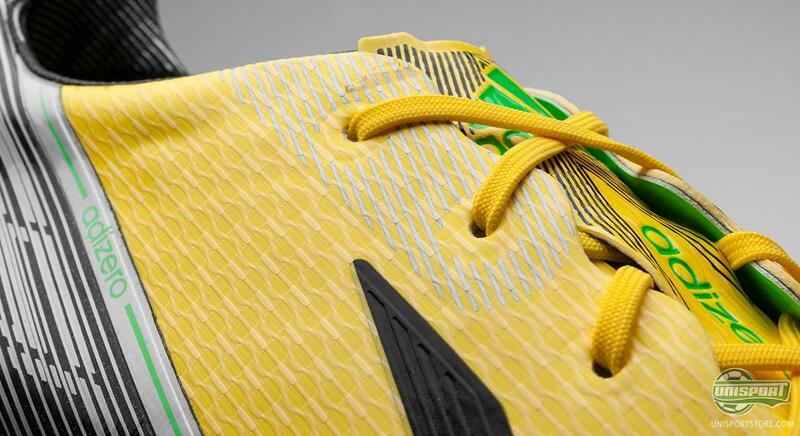 Therefore, the Sprintweb construction has been changed, so there now is a big Sprintweb band on the heel of the boot instead, to give maximal stability. Furthermore, Adidas have kept their TPU bottom frame as well as the internal TPU support bands, that make sure the boot keep its shape and stability. As something new, the famous Adidas stripes on the side of the boot, have been made into a part of the sprintweb construction, which gives support to the boot and it's shape, as well as making the upper more flexible compared to the last generations. 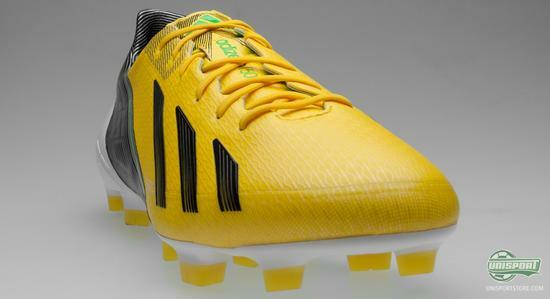 The upper on the microfibre-boot is made with Sprintskin II, which is made by the Adidas' microfibre-material AdiLite Twin. This material is just 1,7 mm thick, which makes for an ultra-sharp touch on the ball. At the same time the material has been treated with a surface-texture, that is slightly adhesive, which gives better grip on the ball, when you're dribbling and when you need to control the ball. 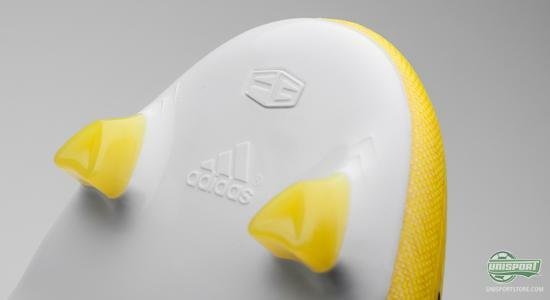 The same has been done to the Adidas stripes, so they too are sticky and work as control elements. They therefore provide three functions; branding, Sprintweb and ball control  all of this without weighing extra. There's been quite a few changes to the boot's upper, but if you turn over the new Adizero, you quickly realise, that the bottom really hasn't changed at all. The boot is equipped with the same Sprintframe sole and stud-configuration as the third generation, and Adidas have hereby stuck with their lightweight sole concept. The Sprintframe is no more than 1 millimetre thick in some areas, but thanks to the torsion bars under the midfoot, the Sprintframe is still rather stable and flexible. 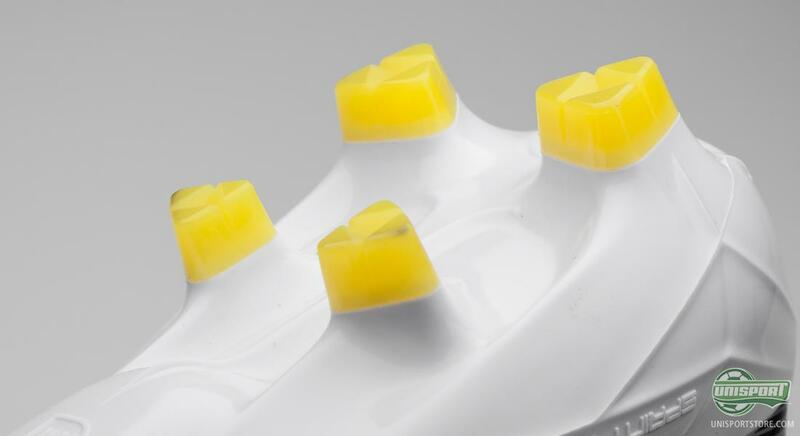 The Adizero's stud configuration includes differing sets of studs in order to improve acceleration, running sideways, as well as, the stability. 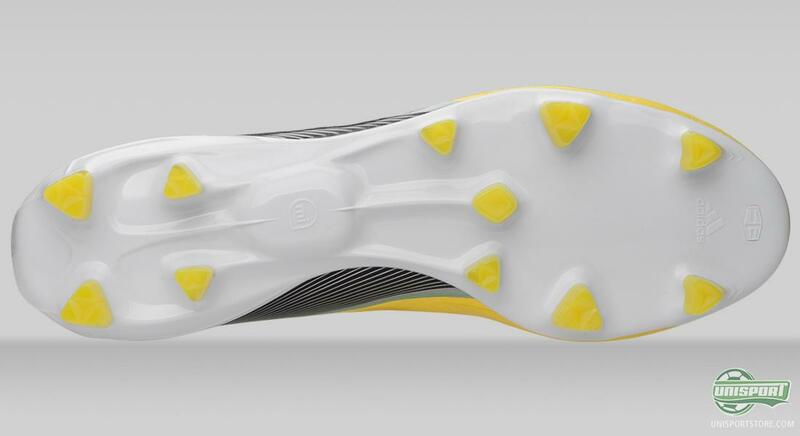 Furthermore, the Adizero is, of course, MiCoach compatible, meaning that you can use your MiCoach chip and hereby collect data regarding your movement on the pitch. The chip can be placed in the sole of the boot, where it can track, for example, how fast and what distance you run, as well as, how active you have been during the match or training. 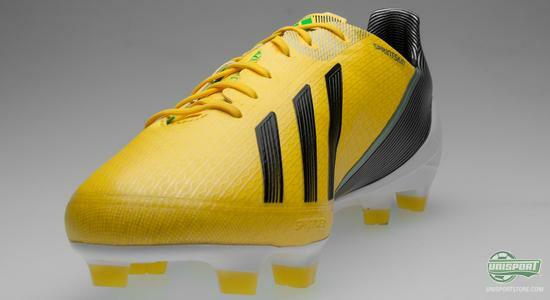 The Adidas F50 Adizero will firstly be exclusive to Lionel Messi, and then later on the other big Adizero stars, such as Benzema, Villa, Alves, Bale and Robben will join in on the fun. We are very much looking forward to see the Yellow/Black/Green boot take on all of the big football pitches across Europe. You can already watch Lionel Messi wearing these new boots tonight, as FC Barcelona travel to Glasgow to meet Celtic. 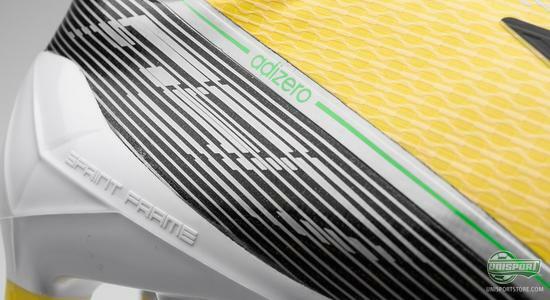 Also, you can check out the full Adidas F50 Adizero collection right here. 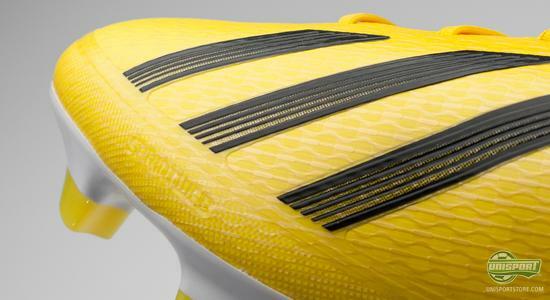 Now that you have seen and read about the new Adizero we would love to hear your opinion on it  do you think Adidas did the right thing to stick with the already successful attributes  or would you rather have seen a more drastic makeover? Feel free to share your thoughts on design, colour choices and technology in the box just below.